It’s that time of year again, AP review, and whilst Atlanta in the spring tends to feel a long way removed from Christmas, this really is the most wonderful time of the year for any student preparing themselves for the AP Chemistry exam in the first week of May. I say that mainly because the barrage of new material is now over, and while it is true that the really hard work is still ahead, there does come with review a sense that there might be a light at the end of the tunnel, and a golden opportunity to repair some previous transgressions. 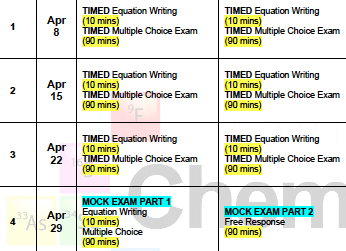 Each year I reserve a four week period in April that allows my AP students to do a comprehensive review of the material that they have been exposed to during the previous eight months, and this period is arguably the most crucial of all timeframes in terms of their ultimate success. For many years it was always a challenge to get through all of the AP material in order to arrive at a place where the everything had been covered, and there still be the opportunity to have a full month of review. With the recent shift of the AP chemistry exam to a day that is eight days earlier than in the past, that challenge has become close to impossible to pull off. It simply cannot be achieved with a few shortcuts, but I continue to feel that it is better to be quicker early in the course and have a large period of review, than be more deliberate and methodical early and end up with much less review time. I think it puts the kids in a better frame of mind. Teaching AP chemistry as a first year class to sophomores has many challenges. The most obvious and profound is the fact that the material needs to be delivered and assimilated at breakneck speed. The students rarely have time to reflect on the information that is passing before their eyes at such a rapid rate, and the chance to fill in the gaps is seldom afforded them. This is one of the reasons that review is so important. Students get the chance to sit down and think about the areas of the course that they did not fully grasp the first time around, and hopefully they get to fill the gaps in knowledge and understanding that will have inevitibaly arisen during the year. In order to fill those gaps it is vital that students are honest. It takes a certain level of academic maturity, and indeed general maturity, to make an honest and accurate assessment of what one does not know, but without that analysis the kids will never improve their knowledge base. It’s far too easy (and close to a complete waste of time), to get into a comfort zone where you review things that you already are comfortable with, and where you answer questions that are easy for you. It’s vital to tackle questions and material that you do not find easy – it’s the only way that you can improve. The other valuable aspect of review is that it is often the time that students get to see ‘the bigger picture’. What can seem like somewhat disparate, unconnected topics as the year is progressing will hopefully come together and links between topics can be forged. These connections are the bridges that help students enormously, and the last month of the course can really help those bonds to be made. In order to help the process, I construct a month long review program that looks like this. Another action that can help kids have an effective review period is to construct their own review schedule for outside of class time – AND STICK TO IT! Like all good intentioned things, the planning means nothing without the execution. I have control over what happens during the review period in class time, but the students are responsible for the management of their own time, which should be noted, is much more abundant than the time that is mandated via class. The best, most successful students take care of their part of the bargain too.